Let your style steal the show with a completely adorable and trendsetting pair of bow earrings. 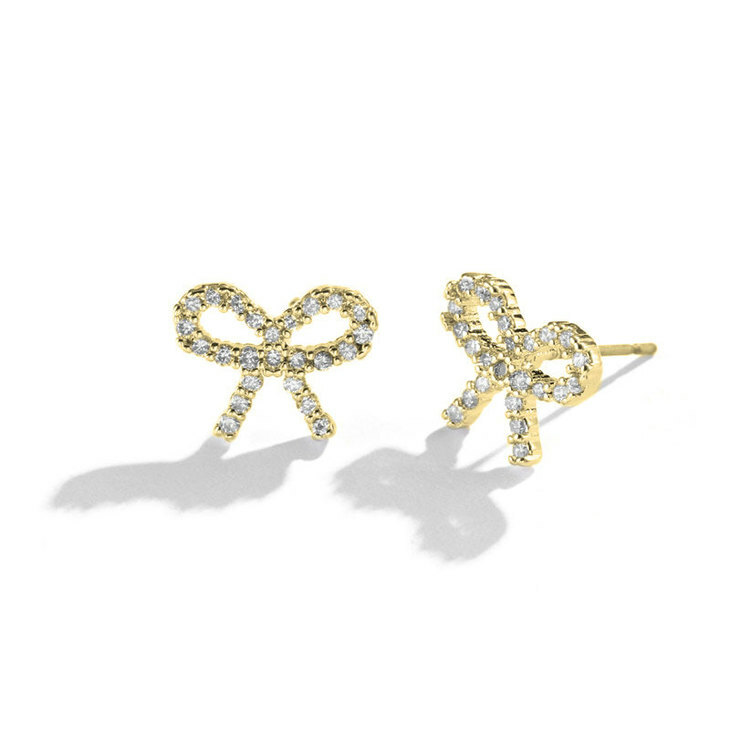 A chic way to express your inner girly girl, these Cubic Zirconia Bow Earrings are simply exquisite. Crafted in the dainty classic bow style, in your choice of materials from sterling silver to gold plating to rose gold. The perfect gift for your bridesmaids, a significant other, or even just a beautiful way to treat yourself to a new accessory. Buy Now! Your review was successfully submitted. Your email is not shared. What is the difference between the box chain and rolo chain? The chain types available for our sterling silver and 24k gold plated products are the box chain and rollo chain. The chain styles that comes with the necklace and the available chain lengths are indicated in the product’s page specification table. The Box Chain is the chain featured to the left and the Rollo Chain is the chain featured on the right. You can return new, unopened jewellery sold by oNecklace.com within 90 days of delivery. Please note that there will be a 30% restocking fee on all items. In the event you receive a damaged piece of jewellery or a piece of jewellery with a mistake, please contact us immediately via the ‘Email” icon shown on the bottom left of this window and we will do everything we can to be sure you are 100% satisfied with your order. Can I see the design of my name before I make my purchase? Yes! Try using the Name Preview Tool found on the top right corner of your screen. This will give you a rough idea of how your name will look in different fonts. To get an exact design send us an email requesting your name in a desired font and our graphic designers will gladly create a design for you. Do you sell chains separately? Yes, we sell chains separately if you have an order. Please contact our customer service team at customerservice@onecklace.com to make your purchase. Yes, all our products contain no nickel. Can I engrave a message on the back of the pendant? Unfortunately we're unable to do engravings on the reverse side of the pendant, however we can custom engrave any words or numbers on the front side. Can I exchange my chain for a different length? Yes, it's definitely possible to exchange the chain, Please contact our customer service team at customerservice@onecklace.com to get instructions. Can I write in Arabic? We have name necklaces in Arabic! Check out our cute Arabic Name Necklace styles. When ordering please write name / word in Arabic. If you do not know Arabic we will happily translate your name for you from English. How do I keep my jewellery looking new? We advise that you follow the tips shown in the links for looking after your jewelery as each different material needs to be cared for in its own way. Can I put an accent symbol on my name? Yes! Please when providing your name simply include the accent where you would like it to appear. I Love Love my necklaces I bought 2 and will be buying more! I got the real gold name. Omg. I love it. Favorite price!